All Access Fashion Back At Tysons Galleria September 27-29! After Becca's Picks, FNO, the District Sample Sale, and Washingtonian Style Setters, we are excited to wrap up Washington's most fashionable month with a bang at Tysons Galleria on September 27-29 with ALL ACCESS: Fashion. 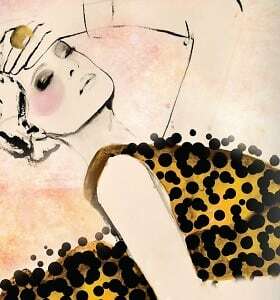 ALL ACCESS: Fashion is a three day fashion and trend event that will allow fashionistas (and fashionistos?) to witness the excitement and energy of the international collections at Tysons Galleria, shop the best of the season, meet style icons and experience the frenzy usually reserved for fashion insiders. Explore the new culture of luxury from desire and innovation to sustainability and travel. Presented together with The Fashion Group International of Washington, D.C. This ticketed event will be moderated by Editor in Chief of DC Magazine Karen Sommer Shalett at the Ritz-Carlton in Tysons Corner. 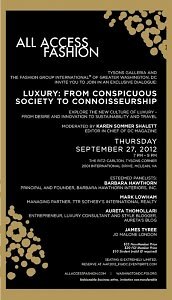 The panel is comprised of interior designer Barbara Hawthorne, TTR Sotheby's Managing Partner Mark Lowham, Washingtonian Magazine fashion writer/consultant/socialite Aureta Thomollari, and James Tyree of Jo Malone London. Experience the trends with a full day of events including trunk shows, designer and celebrity appearances, branded lounges, GofG photographers, and couture experiences. In-store experiences from Emporio Armani, 7 for All Mankind, Aram, Ermenegildo Zegna, Anne Fontaine, Millers' Furs, The Ritz-Carlton, Thomas Pink, A Pea in the Pod, Salon Cielo, Jacadi, Tommy Bahama, Vineyard Vines, Hallmark, Bally, Basler, Bo Concept, Cache', Comfort One Shoes, Stuart Weitzman, and Saks Fifth Avenue. A portion of sales at participating retailers will benefit the Make-A-Wish Foundation. Style Platform Presentations by A Pea in the Pod, Vineyard Vines, Juicy Couture, Basler and Cache'. Level 1 near Williams-Sonoma Grande Cuisine.